On the occasion of National Voters’ Day at District Level Function held at Bikram College, Patiala on 25th January, 2016. NCC Cadet Ishnoor Singh Ghuman bagged the 3rd position in Debate Contest. 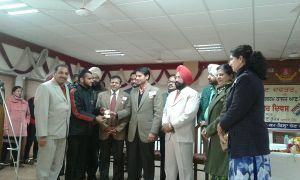 Deputy Commissioner, Patiala honoured the cadet. College Principal congratulated Ishnoor Singh on this achievement.